Just a little heads up that this post was written by my lovely Mummy. She has been on most of the cruises that I’ve been on and took me on my first cruise when I was 11. Thanks Mum. My parents actually received a full refund for this cruise because of the problems caused at the port (so did everybody else on the cruise! )… A move that I really respect! Please don’t let this review put you off trying MSC. We had an AMAZING cruise on the Mervigilia over Christmas and I’m cruising on the Bellissima next year! 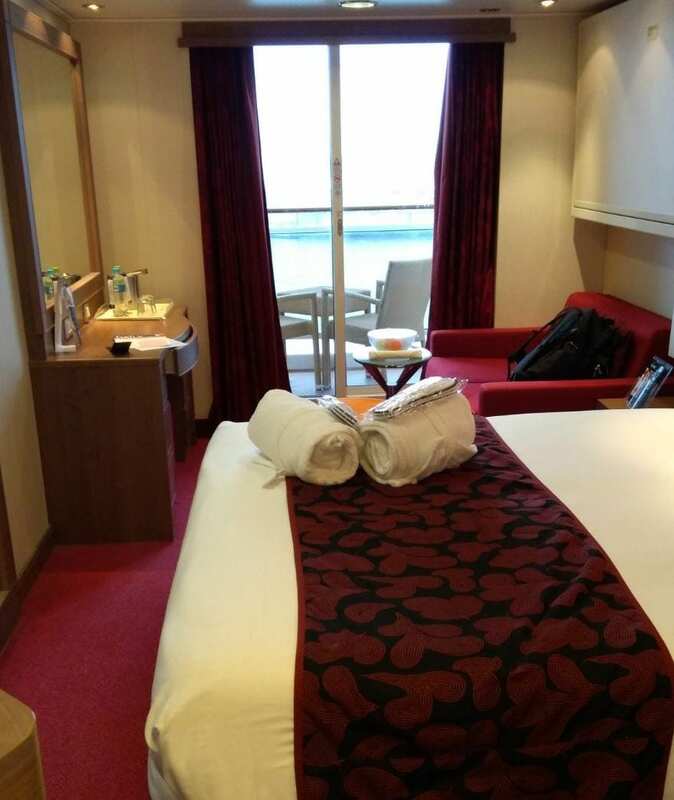 More about our Meraviglia experience here: MSC Meraviglia, Christmas cruise. 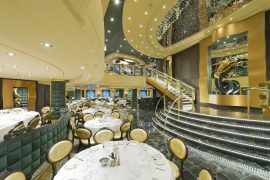 I’ve often looked at short cruises and wondered are they really worth it? Are they just be a glorified “booze cruises” – full of Stag or Hen parties? (Bachelor/Bachelorette parties if you’re American!) Would it be a good way for someone to try out cruising for the first time to see if it is you sort of holiday/vacation? When an opportunity to try one of these cruises presented itself (for a great price), I decided to go ahead and book it! Hamburg is a great place for a city break, and less than a couple of hours flight from where we live. 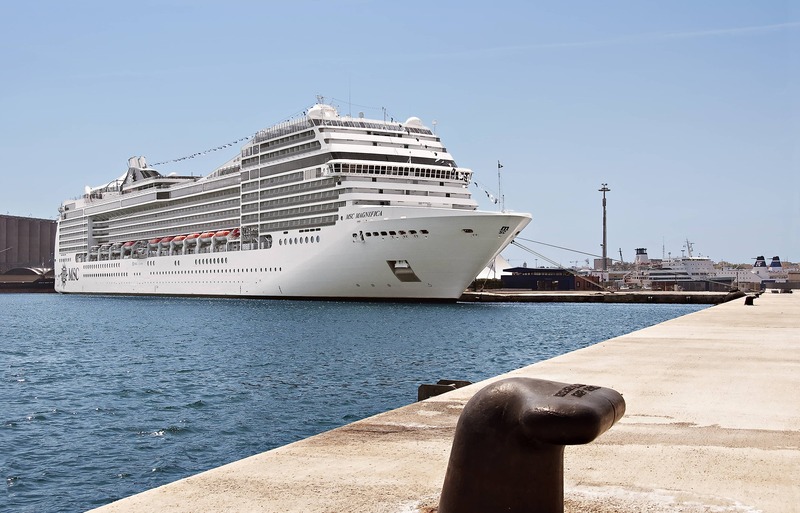 The MSC Magnifica was sailing back from Hamburg to Southampton, and the journey took two days. We were able to combine the city break with the short cruise to make a memorable long weekend away. We have travelled with MSC a couple of times before, most recently on the Meravigilia over Christmas. I was well aware and accepting of the differences between Italian/British and American cruise lines, and like to think I am reasonably easy to please…we loved the Meraviglia. The Magnifica was a lovely ship, clean and easy to navigate. The cabin was lovely. It had a spacious feel to it and had a sofa bed and a pull-down Pullman bed so could easily be used as a family cabin. The cabin steward was very welcoming, When we arrived he was still cleaning our cabin and we left him to it, and went off to explore. When we returned the cabin appeared clean, and I looked around anxiously for the promised tea and coffee making facilities. (They have been advertising widely in England that they will be present on all ships sailing in and out of the UK). They were nowhere to be seen, and I was starting to panic – we’re English we had been promised tea! It’s a major disaster! 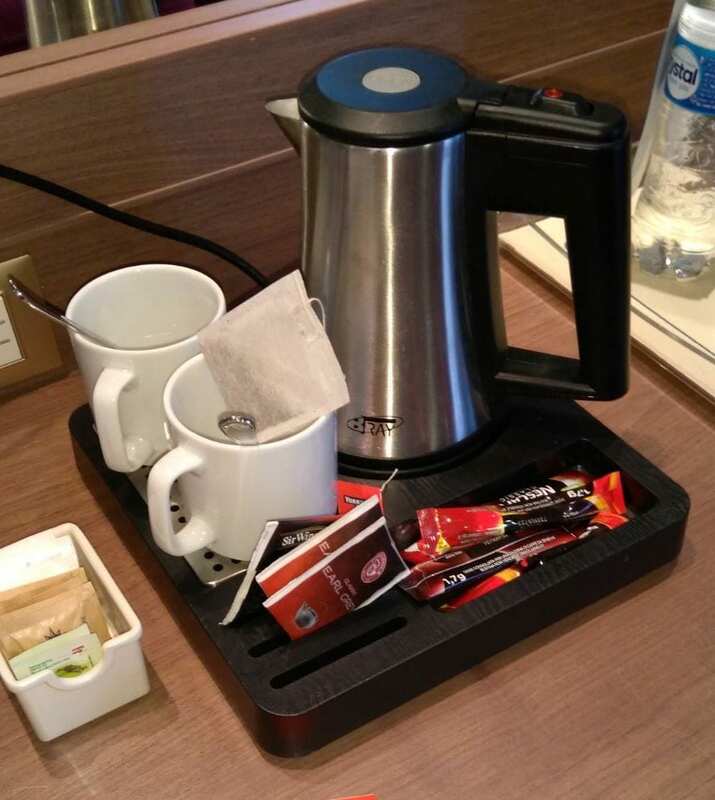 At that moment the smiley steward reappeared with a tray with a kettle, tea bags and coffee sachets. “Result!” I thought as I set to make two cups of tea. Only when I got to the point of fishing out of the tea bags, I realised that we had no milk. I went in search of the steward again, thinking he had just forgotten those little milk pots or creamer, but no. The poor man looked totally bewildered as to why I might want milk. (I am not sure these Italians understand the finer points of English tea making!) Luckily we were very close to the buffet, so we were able to make a daily trip upstairs for a mug of milk that we kept cold in the ice bucket. Crisis averted! As we are MSC “Black Card” holders (Lattitude status match – Emma has talked about this at length) we got a little present each day. 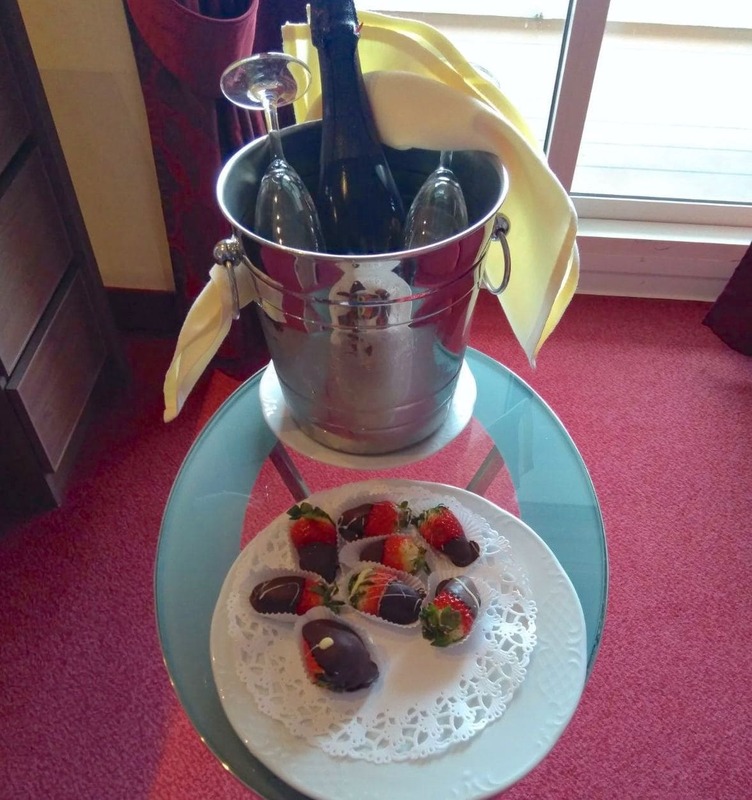 On the first, we got a bottle of Cava and Chocolate dipped strawberries! Yum! On the second day, we received two chocolate Magnifica ships – perfect for an Easter Sailing! I do love a freebie! The ship didn’t seem very full, and there were plenty of bars and places to sit. There was never that sense of overcrowding that I have experienced at peak times on other ships. The top decks were literally empty, but that could be down to the fact there was snow and ice on the ground. Anyone risking a dip in those pools would have ended up with frostbite! 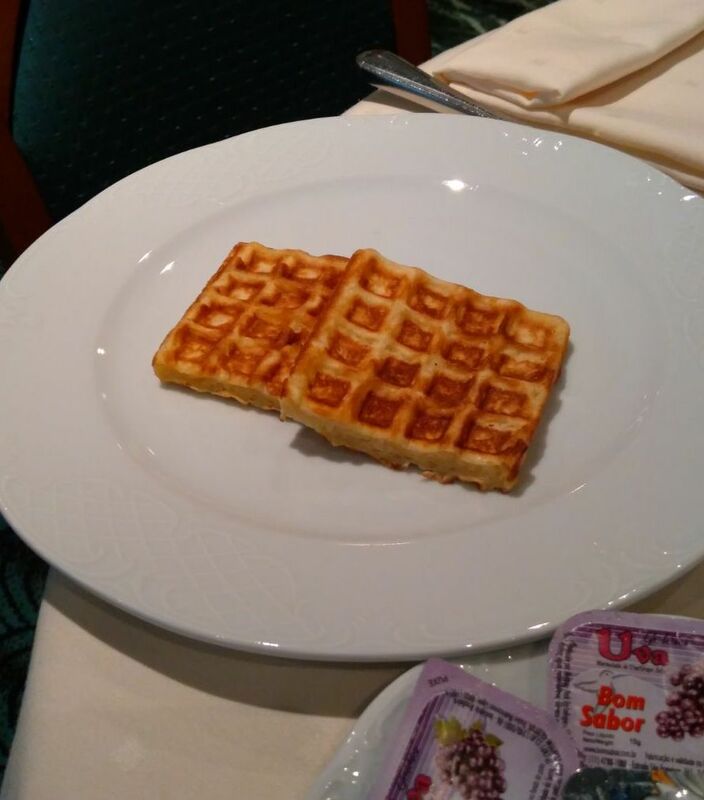 I have heard people complaining about the food and the service on MSC but largely disregarded it, as I have never had any issues in the past. It has to be said though that the quality of the food and the service were pretty poor. 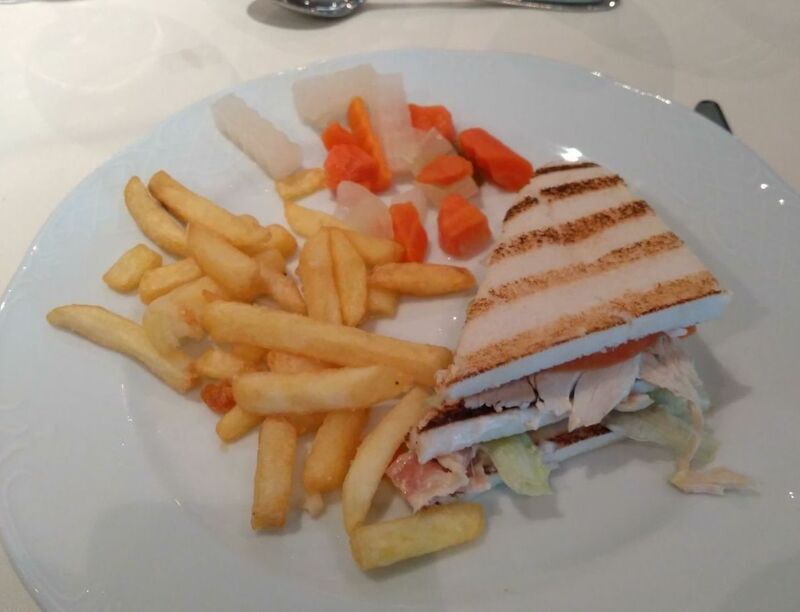 Below is a photo of MSC’s club sandwich and a photo of one we had onboard NCL before for comparison. We went to the main restaurant for breakfast and lunch, but not the evening meal. This was mainly because although we asked for the early sitting, but were given 8.30pm – which was a bit late for us. Also as a couple travelling, we would have been on a large table of eight, and we didn’t really fancy being that sociable! We went to the theatre both nights. The two shows consisted of singing and dancing, the music was bland Euro-pop, none of it in English. 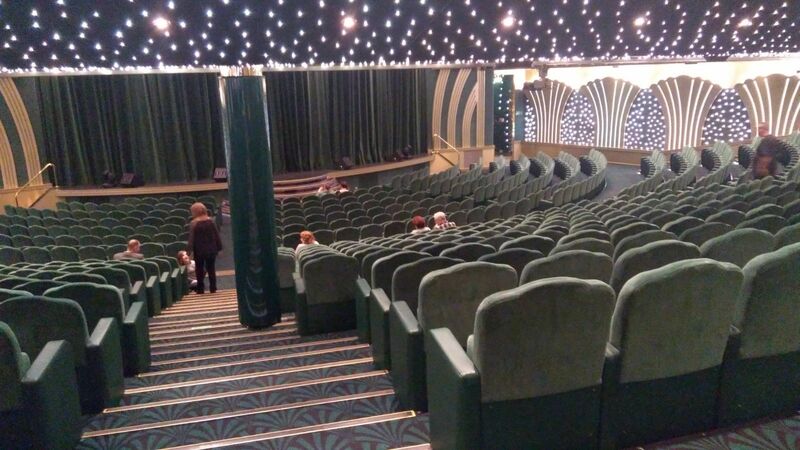 The theatre was about a quarter full on both nights – maybe everyone else knew something I didn’t! Both shows lasted barely thirty minutes – but that was probably a blessing really! I couldn’t help thinking enviously back to proper shows and tribute bands I had seen on other cruise lines and wishing I was elsewhere! The worst thing about this short break was the embarkation and disembarkation – It was a times, pretty ugly! One of the perks of “Black card membership” is so-called Priority embarkation and disembarkation. The cruise terminal was basically a big, oblong shed. When we arrived there at lunchtime and there were already people trying to get inside the building, and out of the wind and snow. We joined in alongside the other passengers, some with children, prams, buggies, older people- all trying to make their way through the three doors to the terminal. Once inside the building, it appeared that we were all funnelling through one small doorway, where we were separated into two lines. On the right so-called “priority boarders” were held in a pen – like cattle – tightly packed, unable to move or sit down. I was so grateful we are both fit and able-bodied. Having a child with us would have been very scary. I kept thinking of my ninety-year-old mother who is going on this very ship in a couple of months. She can’t stand for any length of time and is pretty unsteady on her feet. How will she cope? The “non-priority boarders” were in a long snaking line behind barriers and ropes – like you see at an airport. Nothing was happening, no one was moving, everyone was getting angrier and angrier – with good reason I would say! Those who weren’t priority boarders had to watch as we went in front of them, I would have been hopping mad if I were them! It took us over two hours to board, and I heard from other non-priority boarders that it took them FOUR HOURS to get on to the ship! Is that acceptable? I think not! When leaving the ship in Southampton, we again were told we could get priority disembarkation. We should have left the ship first at 8.30am. What could possibly go wrong? 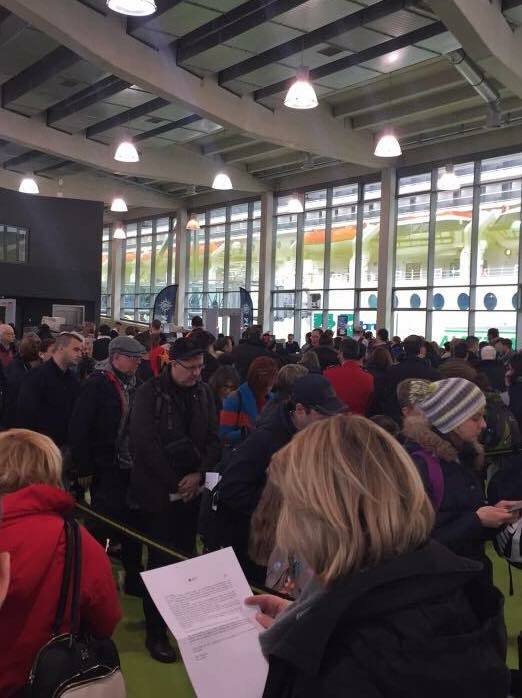 they only have to put the gangway down and scan our cruise cards after all…. If only it was that simple! They blamed the low tide on the fact that they could only put down one gangway and this would delay disembarkation. We finally managed to leave the ship at 10.15am. There were queues/lines of people in all the stairways and corridors. 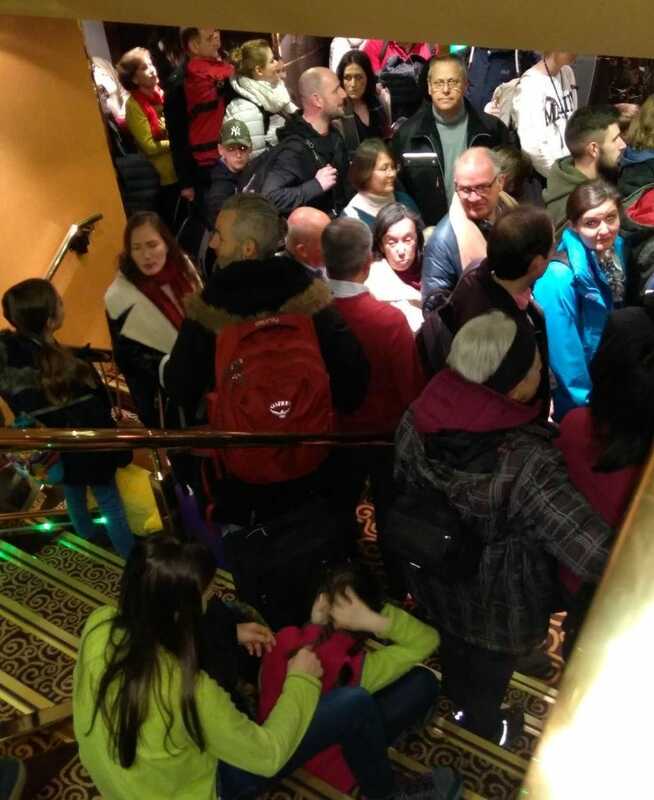 All the people booked on excursions couldn’t get off to get on their coaches. Some were travelling up as far as London, so were keen to get underway. Those who had made their own travel arrangements had taxis booked and waiting outside, but they couldn’t get to them. Others needed to get to the airport as they had flights to catch. It was all very stressful! Luckily the only one waiting for us was our lovely Emma, and as we finally walked through the dock gates in the pouring rain, was there to meet us! Perfect timing, I was so pleased to see her! In conclusion – Would I do it again? Well yes, I would – but not with MSC! I enjoyed cruising out of Hamburg along the Elbe River, and it was lovely to sit on the balcony and see the English coast come into view. If I was on a cruise line who had some idea about organisation, it would have been great! It didn’t appear to be a “booze cruise” or if it was, I wasn’t really aware of it. We didn’t have a drinks package, so didn’t spend much time in the bars. (MSC were very keen to sell the drinks packages, and they asked literally ten times if we would like to buy one, but for us, it made no sense to do so.) 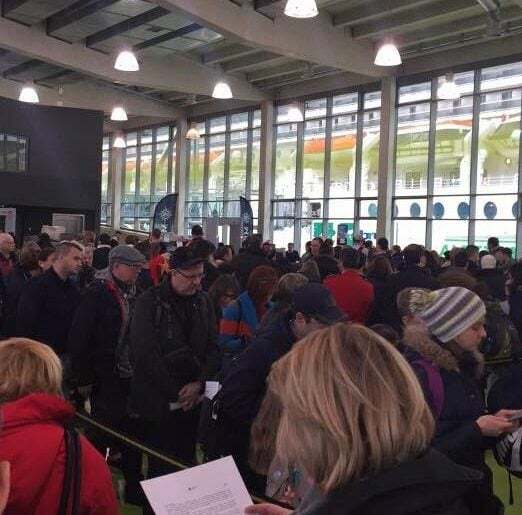 There were plenty of people drinking beer and Prosecco at breakfast time, particularly whilst waiting to disembark – but I think we could have all done with a very stiff drink under the circumstances! 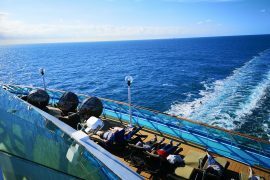 If this had been my first experience of cruising, it would also have been my last, that’s for sure! I could find many more pleasant ways of spending a Bank Holiday Weekend that wedged in a very tight crowd with my European neighbours. Gaynor is my mum and if you are in our Facebook group you definitely would have seen her commenting and liking all of my posts (like a good mum should). Join our Facebook group here! Thank you Mum for writing this post! It’s amazing how much cruises can vary. We all loved our cruise on the MSC Meraviglia over Christmas. 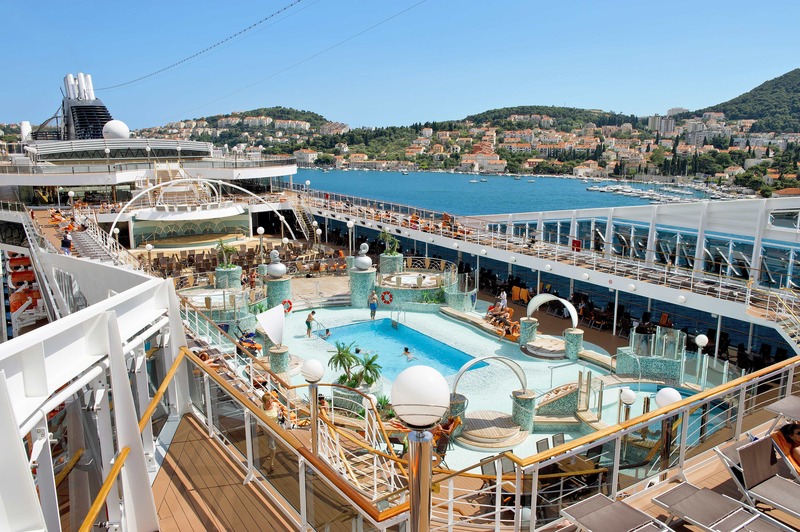 It’s almost hard to believe its the same cruise line as we had no problems with the food or service on the Meraviglia. I should add that this cruise an absolute steal at £110 for 2 nights in a balcony cabin, so can’t complain too much! Emma, your mum did a brilliant job writing this post. Filled with all the pertinent info – the good & the bad (and the ugly)! 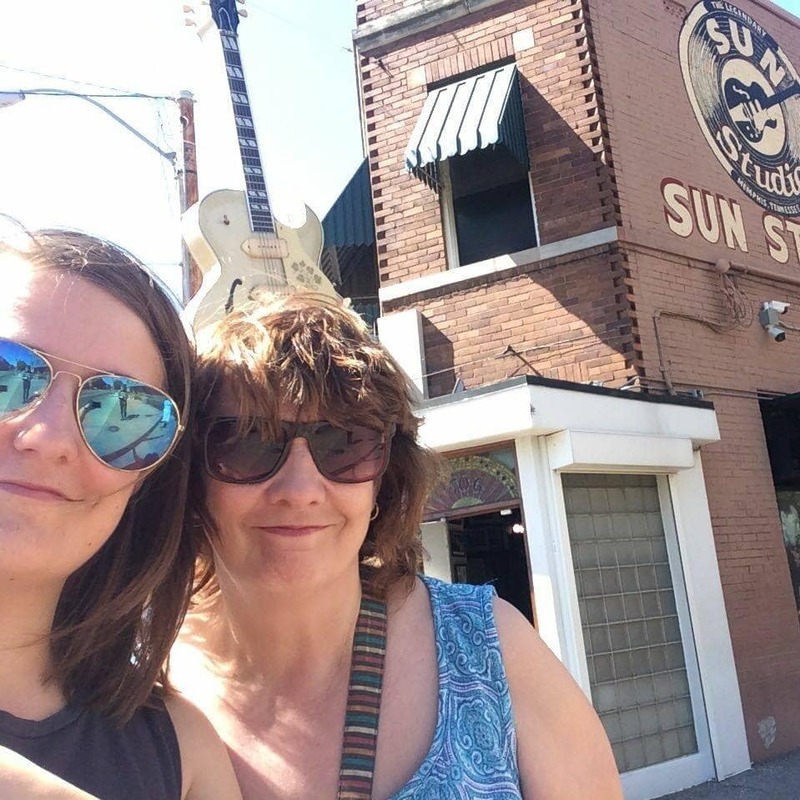 You’d better watch out Emma – she’s done a good job at blogging – vlogging could be next!! I think i should point out that, despite me being unable to get hold of MSC customer services to complain, they became aware of my issues – mostly due to Emma’s blog/website. They gave me a full refund for the cruise along with a 10% off voucher for a future cruise with them. With some trepidation that i have used that voucher and booked a weeks cruise on the MSC Lirica for 2019. We have literally gone for the cheapest cabin and the cheapest fare, and will book our own flights. In that way, if it isn’t very good – we haven’t lost much! The destinations are all good/ new to us anyway – i will let you know!